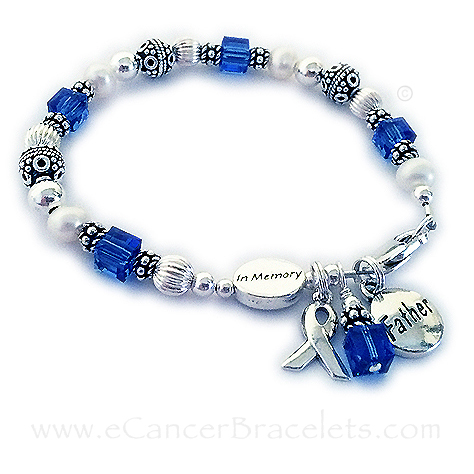 This bracelet includes the Survivor bead (Hope Courage or In Memory options), MOM charm, Ribbon Charm and your choice of color for the beads and Dangle Charm. The Open Heart charm shown is OPTIONAL and may be added below. This bracelet is Survivor (In Memory, Hope Courage) of her Mother (Mommy). You choose the color of the Swarovski crystals. This Ribbon Bracelet is shown with Teal crystals for Ovarian Cancer. This bracelet comes with the Message Bead, Filigreed Mom charm, Ribbon Charm and your choice of color for the beads and Dangle Charm. It is all .925 sterling silver with genuine Swarovski crystals. The Open Heart charm shown is optional and may be added below under the charm drop-down menu. 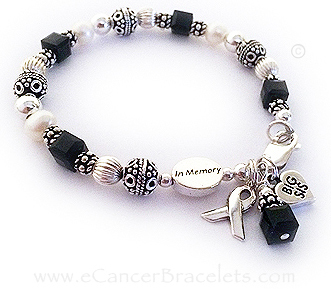 Includes: In Memory Bead, Father Charm, Ribbon Charm and Birthstone Crystal Dangle. 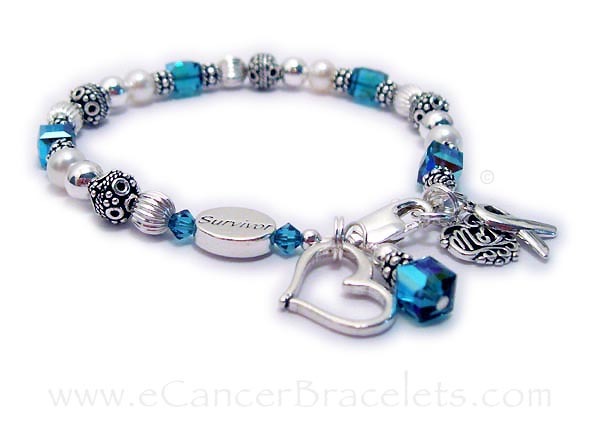 This bracelet comes with the In Memory bead, Big or Lil Sis charm, Ribbon charm and birthstone crystal dangle. Ribbon Bracelet shown with black crystals for Melanoma Cancer Awareness.